Chris Rundlett’s first sailing adventure was on a small Sunfish owned by the U.S. Coast Guard where his father was stationed in North Dakota. There was plenty of wind – but not much water! Since then he dreamed of bigger horizons and sailed whenever he had the chance. Chris is a true son of a sailor. Chris started his maritime career teaching USCG Captains Licensing courses in the Pacific Northwest. This lead to teaching sailing in the San Juan Islands of Washington State. In 2008, Chris started working with a sailing school in the Caribbean – St. Vincent and the Grenadines. He enjoyed sailing in these exquisite waters so much, he decided to stay. 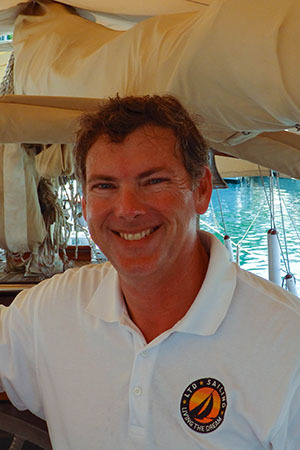 In 2013, Chris started the premier American Sailing Association affiliate school in the Caribbean, LTD Sailing – “Living the Dream!”, with his partner Chrystal Young. They have now opened a second location in the Grenadines at the Port Louis Marina, Grenada partnering with 5 Oceans Marine Group and Five Oceans Marine Group. Chris and Chrystal found that many of their sailing school students were interested in buying boats – making this a natural partnership. Grenada is a great cruising destination with its southerly latitude, excellent marine services and active cruising community. Please call Chris or Chrystal if you would like to discuss the advantages of buying or selling your yacht in the Caribbean. Or stop by the office at Port Louis Marina to say ‘hi’ next time you are in Grenada!